The boss of Stiller Warehousing and Distribution says investing in young people has been crucial in the firm’s success after the third-generation family firm was named Aycliffe Business Park’s Company of the Year. Despite spending £9m on four new developments at its 22-acre site in Aycliffe and a fleet of new vehicles over the last four years, Stiller’s managing director Matthew Stiller insists it’s the time and resources the firm has put into developing young staff which has paid the most dividends. 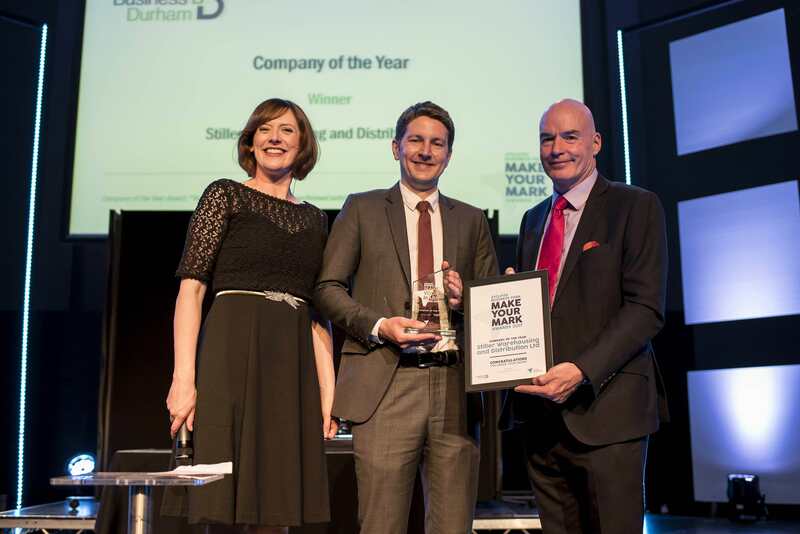 Stiller was named Company of the Year at Aycliffe Business Park’s fourth annual Make Your Mark awards ceremony, attended by more than 200 people at the Xcel Centre. Matthew Stiller, who took over the firm’s leading role from his father Paul in 2017, praised the quality of other candidates during the awards competition. “I thought the ceremony really celebrated apprenticeships throughout which was fantastic to see,” he said. “I’ve had the pleasure of seeing quite a number of newly recruited apprentices walk through the door like Bambi on their first day, and they’re effectively running our business now 10 years later. It’s really gratifying to see that in a decade of working within the family firm. Stiller was formed by former prisoner of war veteran Gunter Stiller in 1954 and he handed the company to his son Paul in 1985, who led the firm for 32 years and guided it through history’s worst-ever recession. The firm, which is due to open a new £2m freight distribution centre on Aycliffe Business Park in July, pipped leading shower manufacturer Roman and Arlington Automotive – two firms which are larger than Stiller in terms of workforce and turnover – to win the Aycliffe Company of the Year award. Mr Stiller added: “Roman and Arlington are both exceptional companies, and we can only hope to grow our business to the size of them one day. “There’s been a lot of very hard work done by a lot of people at Stiller over the last few years and it’s great to have been able to share in some of the success of so many companies on the business park and in the North-East. “When you work in the high-pressure environment of the logistics industry, everything happens so quickly, with next day delivery and all the work and pressures associated with that, so you need to go about your day with good humour and good nature to enjoy it, but also to marry that up with pragmatic thinking. Stiller’s award was handed over by Business Durham managing director Brian Archer. Mr Archer said: “These awards really demonstrate that Aycliffe Business Park is somewhere that is making its mark. “The latest developments at Forrest Park will see the business park continue to grow and ensure not only its importance to the local economy, but its regional and national significance. “Stiller is a fantastic example of a company that has grown and thrived in County Durham, showing great resilience in the highly competitive logistics sector. Other award winners during Make Your Mark 2017-18 were: Apprenticeships & Training (sponsored by Gestamp Tallent): South West Durham Training. Newcomer (sponsored by Fleet Recruitment): Pixel Media. Service Business (sponsored by Logico): Eldon Financial. Engineering & Manufacturing (sponsored by CDEMN): Roman. Employer (sponsored by Handelsbanken): Arlington Automotive. Small Business (sponsored by Maven Capital Partners): M5tec. Innovation (sponsored by Teesside University): Excelpoint. Export (sponsored by Ebac): Crafter’s Companion. Apprentice (sponsored by Razorblue): Kaylee McNally, Arlington Automotive. Heart of the Community (sponsored by Endeavour Partnership): Planet Leisure. Aycliffe Ambassador: John Parnell.